For over 30 years Premier Powder Coating has been a trusted source in powder coating for companies large and small. Utilizing our large batch, and large envelope automatic conveyor line we can tackle most anything customers throw our way. From large weldments, race car frames, and safety railings to truck loads of parts for manufacturer's of ATV/UTV, heavy equipment, store fixtures, and everything in between. Do you have a project you'd like to discuss? Give us a call today! Allow us an opportunity to prove our capabilities to you. 10 ft by 8 ft by 26 ft BATCH oven capacity. Automatic conveyor line capable of 3 ft by 5 ft by 11ft, with a 3-stage wash system. Laser heat scale removal prior to processing to improve adhesion. Custom masking and plugging to protect any surfaces, threads, or other areas during processing. Custom color matching, & color formulation. Finished product inspection, managed inventory, packaging, and drop-shipments to meet customer needs. Our overhead line has a 3' x 6' window that can handle parts up to 11' long, and features a state-of-the-art wash system. Powder is applied with our Gema Spraying System - 8 auto-guns and 2 manual touch-up guns. This system allows us to reclaim unused powder for reuse, helping to minimize costs. Our batch system can handle large heavy parts, such as castings and storage tanks. The oven is 26' deep x 10' wide x 8' high. We also offer sandblasting for mil scale or rust removal. Powder coating is a type of dry coating, which is applied as a free-flowing, dry powder. The coating is typically applied electro-statically and is cured under heat to allow it to flow and form a "skin". The powder may be a thermoplastic or a thermoset polymer. It is used to create a hard finish that is tougher than conventional paint. There are advantages of powder coating over conventional liquid coatings. Besides being an efficient and environmentally compliant process, it produces a superior finish in extreme conditions, and decorative applications. Color selection is unlimited. Available in both high and low gloss, as well as textures - providing customers with a number of choices. We have a large inventory of in-stock colors to choose from, or you may select from one of our color charts. Special order colors are also available. Textures include: glossy, metallic, clears, flats, veins, hammer tones, candies, glitters, and wrinkles. We will assist you to determine the correct color and type of powder for your application. Any masking or plugging required? Date job completion is needed? Do you need Pick up or Delivery (include your address)? If available, send a print/drawing/picture of the item(s). HOW IS POWDER COATING ECO-FRIENDLY AND GREEN? 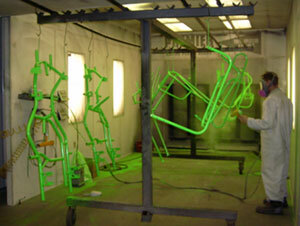 Powder coating is an environmentally friendly process unlike solvent-based wet paint systems. 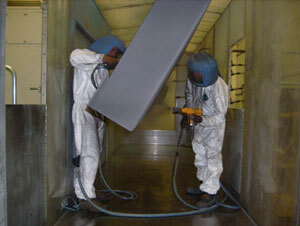 The powder coating process does not use solvents, eliminating dangerous VOC emissions. Being non-toxic it can be used on food service equipment and in its powder for is no more harmful than dust.